Being the most common form of bottlebrush used in gardens, Callistemon viminalis are mainly from Coastal areas of Queensland. Commonly called the ‘Weeping Callistemon’ C. viminalis has a range of cultivars from dwarf to small to medium shrubs. It is actually the weight of the large flowers that adds to the ‘weeping’ nature of the plant that heightens the graceful nature of the plant. Callistemon viminalis or ‘weeping bottlebrush’ is a small to medium shrub used in landscaping for the masses of flowers in spring – autumn. 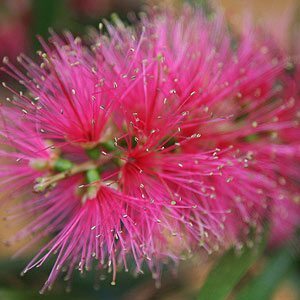 It is mainly the cultivars (listed below) that are offered for sale, all Callistemon viminalis cultivars require similar care. They grow well in a free draining soil and full sun to part shade. Mulch around the plant to retain a cool root run and reduce competition with weeds, however keep mulch away from the base of the plant itself. A slow release native plant fertilizer applied in late winter is beneficial. New plants need protection from frosts when young, a plastic tree guard is usually adequate. Callistemon viminalis – Summary Information. Height – The species will reach around 6 to 8 metres in height. Spread – With an upright weeping habit C. viminalis will spread to around 4 metres. Flowers – Large pink to red from spring to summer. Foliage – Differs depending on the form, some with lanceolate leaves, others more rounded all are a mid green. It is good practice to tip prune regularly from planting to ensure that the plant maintains a good bushy shape. Plants can also be pruned after flowering, similar to deadheading, pruning immediately below the flower. Hard pruning if not recommended, however it can be a successful way of regenerating older plants. Anything in between these two methods seems not to work well. C. viminalis ‘Dawson River’ is a fast growing stub with a natural weeping habit. Very attractive deep crimson flowers, reach 5 metres in height with a similar spread. C. viminalis ‘Little Silver’ a dwarf form to around 1 metre. C. viminalis ‘Hannah Ray’ shrubby habit with scarlet red flowers, around 4 metres high.